As the wealth-divide and environmental crises grip public awareness, the world is finally catching up to the vision and ideas of Carole Condé and Karl Beveridge—pioneering artist-activists who have been working for social change since the mid-‘70s. Inspired by the artists’ visual innovations and feisty wit, Portrait of Resistance intimately captures Condé and Beveridge as they create provocative staged photographs about the rights of workers, the environment, and the global financial crisis. Roz Owen and Jim Miller formed anti-amnesiac Productions in 2006 to produce their independent film and video projects. Owen is an award-winning director/writer who works in drama and documentary. Miller is an editor/producer who has been producing socially engaged documentary in a range of media disciplines for over twenty years. Their short documentary, Community Matters, won the 2008 OAAG Best Visual Art Film award. 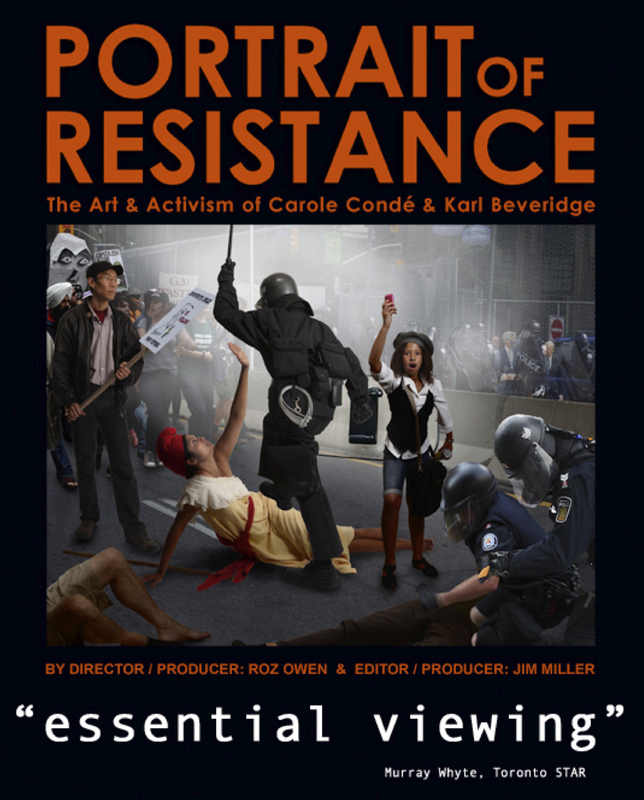 Their feature documentary, Portrait of Resistance: The Art & Activism of Carole Condé & Karl Beveridge, has won critical acclaim at festivals, art galleries, and community screenings nationally and internationally. Owen, currently teaching film production at Ryerson University’s School of Image Arts, is preparing to direct her feature length dramatic film, Pippas’ Keeper. Miller is developing an ambitious curatorial project that will mark four decades of Condé and Beveridge’s pioneering art and activism. Funding for this event is generously provided by the Council for the Intellectual and Cultural Development of the Arts at Wilfrid Laurier University.